I was thinking, is it really worth going to Fiji for my degree graduation from Melbourne spending huge amount of money in airfare? then i decided to go, without having any proper reason to go. After reaching Fiji, i was really happy, meeting Friends and spending time with them, and really was not thinking any thing about my Graduation. On the day of Graduation there was some excitement in myself. Because i was wearing professional dress, white shirt and black pant with Tie and adding to that, my graduation gown. wow. It was a great feeling. 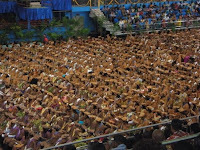 When i reached graduation arena, there were 1300 graduates with me. such a large number. Every one in professional dress and i joined them. All of us were standing outside arena. 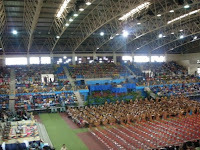 when the time arrived we got signal to walk-in to the convocation arena. Believe me !! More then 4000 people, gave us clapping ovation when we were having a small parade in the Arena. When all graduates got seated, there was a standing ovation when Vice-Chancellor of Our university entered the arena. WOW.....Pin-drop Silence....... SHU.......... !!! Another memorable part my graduation was three of my Friends. Kapil, Swaz and DC. All of us, spent our three years together, studied together and graduated together. When the function got over lots of photo clicks with all my UNI friends with whom i have spent 3 full beautiful years. When i was in Plane, back to Melbourne, I was thinking that with money i can never get this enjoyment, which i got during my graduation ceremony. Damn....Now really missing those days...But still lucky enough, as i will also be attending my Masters Graduation at Deakin University !!! Approvingly your article helped me truly much in my college assignment. Hats off to you post, intention look progressive for more interdependent articles in a jiffy as its sole of my choice topic to read.